Elegance as seen in the Victorian era. Easy to read even at a distance of 20m (65.6ft). The quartz movement is protected against the weather by a plastic cover. Works with only 2 AA batteries (sold separately) which last for up to 18 months. 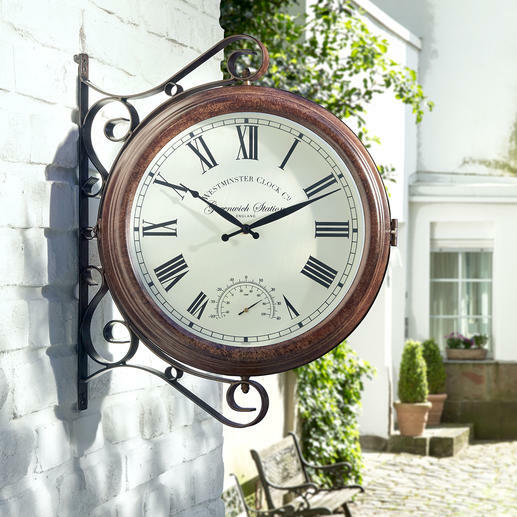 English flair for inside and outside: The XXL station clock made of weatherproof metal. Impressive eye-catcher in your hall, summer house, on your living room wall, etc. Dial and thermometer on both sides. You can still see these at some railway stations in Britain: Double-sided mounted station clocks in a similar size (diameter: 38cm (15")), which clearly show the time and temperature to travellers. The clock is identical on the front and back – even hurrying passengers can see the information at a glance. The housing, with decorative profiled frame, and the artfully curved wall bracket are robust and made of metal and lacquered bronze. The 4cm (1.6") black roman numerals indicating the hours stand out beautifully against the ivory coloured dial. Fine minute markers and a ring of numerals in which black hands indicate the hours/minutes. A scale at the bottom of the dial shows the temperature, in both Celsius and Fahrenheit. The word “Greenwich” is elegantly displayed. A cover keeps dirt away from the dial. The clock can easily be kept outside all year round. Neither fog, snow nor steady rain will affect it. The pre-perforated metal plate of the wall bracket can be installed very easily. 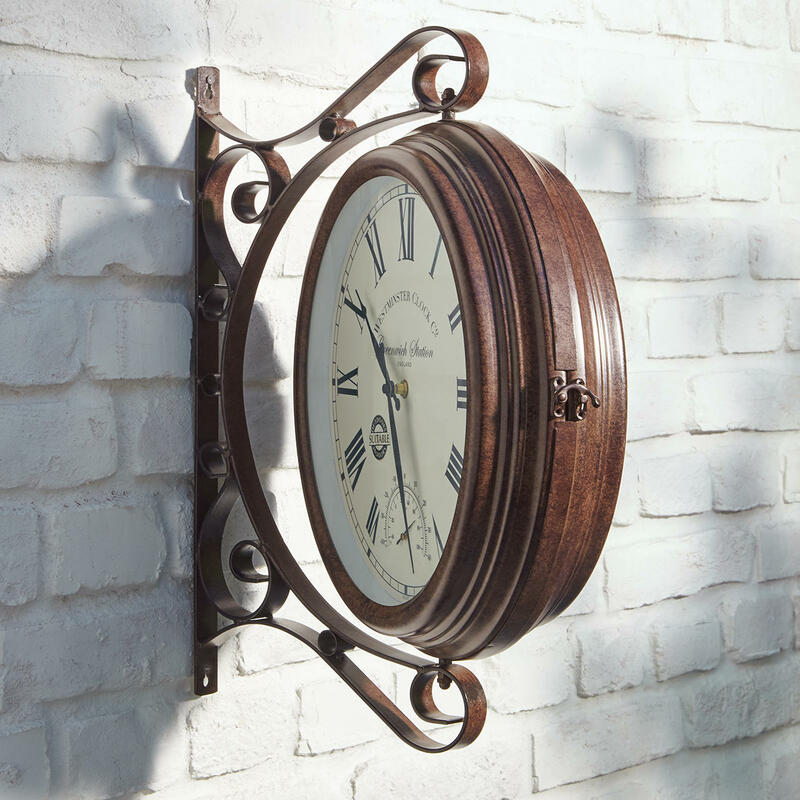 The clock has a diameter of 38cm (15") and is 12cm (4.7") thick. Wall bracket: 53cm (20.9") high, wall bracket 27cm (10.6") long. Total weight approx. 4.2kg (9.3 lbs).